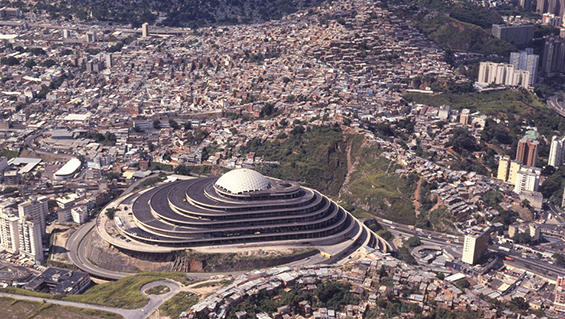 Inspired by the architecture of Frank Lloyd Wright and capped with a Buckminster Fuller dome designed by Donald Richter (the first such dome installed outside the U.S.), Venezuela's concrete spiral seemed destined to consolidate Caracas as a modern Latin American capital in the late 1950s. A futuristic shopping mall with 2.5 miles of vehicular ramps, El Helicoide would have featured 320 stores, exhibition halls, inclined elevators and close-circuit television. The project faltered months from completion and the building was relegated to the backdrop of the city's southern slum-covered hills. Despite myriad attempts at recovery, the site has only known two uses: as a temporary refuge for 10,000 people in the late 1970s, and as a police headquarters and penal institution since 1985 on. Celeste Olalquiaga is a cultural historian dedicated to the contradictions and leftovers of modernity. She is the author of Megalopolis: Contemporary Cultural Sensibilities and The Artificial Kingdom: A Treasury of the Kitsch Experience. Most recently she co-edited Downward Spiral: El Helicoide's Descent from Mall to Prison. This event is open to current Cooper Union students, faculty, and staff. The public may RSVP to architecturelectures@cooper.edu specifying the event title. Room 315F.